Pakistan's Meteorological Department said more heavy rains were in store in the next few days. Islamabad, Pakistan (CNN) -- Heavy monsoonal downpours worsened massive flooding in Pakistan Saturday and weather forecasts provided little hope of drying out in the next few days. The flooding that began in the northwest threatened places as far south as the port city of Karachi. Districts in the southern province of Sindh were on high alert Saturday as more rain swelled already bloated rivers and inundated drenched earth. Pakistan's Meteorological Department said more heavy rains were in store in the next few days, threatening to deepen the worst natural disaster Pakistan has experienced in recent history. And the monsoon season is only halfway over. Pakistan's disaster management authority estimated that 650,000 houses have been damaged or destroyed. By comparison, the earthquake of 2005 affected 3.2 million people and damaged or destroyed 611,000 homes. "Pakistan has been hit by the worst flood of its history," said Prime Minister Yousuf Raza Gilani in a televised speech Friday. "As I speak, the flood is still engulfing new areas and adding to the scale of devastation." 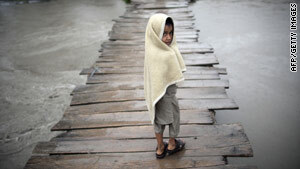 Gilani said a true assessment of the loss to life and infrastructure can be determined only after the water recedes. He appealed to the international community and to Pakistanis living abroad to dig deep into their pockets. As the rains continued, aid agencies feared not being able to alleviate the suffering of flood victims desperate for food and shelter. Patrick Fuller has worked for the International Red Cross for 15 years and been involved in other disasters. Still, he said he was shocked by the flooding and called on the world for donations. "These people need help desperately and the world needs to wake up," Fuller told CNN Friday. People can't go back to their homes. They are living in a precarious situation." He said there has been a conspicuous absence of aid in some areas, despite efforts by the Red Cross and other international aid groups. Parts of the Swat Valley remain inaccessible by road; helicopters provide the only way in or out for people, food, clean water and medicine. Those flights were hampered Saturday by more bad weather. Meanwhile, among the suffering, anger grew at the government for perceived lack of action. They hurled stinging criticism at President Asif Ali Zardari, who was in England for talks with British Prime Minister David Cameron during the worst of the crisis. "We elected him," a resident of the flooded town of Chachran Sharif said about Zardari. "Where is he?" U.S. emergency relief teams were continuing to arrive in Peshawar for distribution by Pakistan's National Disaster Management Authority, the State Department said. In all, the U.S. Agency for International Development has committed $35 million in aid to international organizations and non-governmental organizations, it said. CNN's Reza Sayah, Dan Rivers and Moni Basu contributed to this story.